Local Quilt Shop Owners – My Heroes! I think nearly everyone who is a quilter (no matter if they are a piecer or machine quilter) has at one time dreamed about opening their own quilt shop. Just the thought of all that fabric at your disposal, to make ANY quilt you want, at any time you choose, is enough to make a quilter drool or swoon! But running a quilt shop is HARD, HARD WORK! Personally, I admire anyone who owns a quilt shop! They are the true heroes of the quilting industry! Most quilt shop owners are receptive to new machine quilting businesses, but if they are not, don’t blame them. There can be reasons you don’t know about as why they are feeling this way. Maybe they have been “burned” by a new machine quilter in the past. Maybe they work with a specific machine quilter or two that are already established. Whatever the reason that a quilt shop owner may not be receptive to your new business, respect them for that. Having a local quilt shop “on your side” is great, but if this is not the case, you need to think creatively as to how you can start (or increase) your business without their support. Fortunately, this is not too hard to do and we will talk about this in the future on this blog. The next time you are in your local quilt shop, give the owner a hug, a pat on the back or tell them “Thank You” for all they do for the local quilters, the local economy and for the quilting industry! Machine Quilting Myth #3 is a “sort of” myth. This myth – If you have a quilting machine and want to start a machine quilting business, you will have instant customers and be very successful! can be true, but, in reality, you will have to work to get your machine quilting business going. When I started machine quilting over 15 years ago, there were only a few machine quilters. There were no home quilting machines, only the “big girl” industrial style machines which cost several thousand dollars. Becase there were not many machine quilters (locally or nationally) anyone who wanted to begin a quilting business DID have an instant business. When I was seriously thinking of purchasing a quilting machine 15 years ago, I had a couple of people who called me and asked if I got my machine yet and if I was ready to take their quilts! At that time, I had only told one or two people that I was thinking of getting machine! Times have changed and so has the machine quilting business! Today, there are many more machine quilters and many more quilting machines on the market. Many people are now purchasing a home quilting machine to quilt their own quilts and maybe charity quilts. Machine quilting is more accepted and I am always amazed at what machine quilters are stitching on their own quilts and their customers quilts. Personally, I think we can do more with our quilting machines than hand quilters can do with a needle and thread! Because of all of this, it may be harder for someone to start a machine quilting business today than in the past. This doesn’t hold true for everyone. You may live in an area where there are not many professional machine quilters or you may have a large circle of quilting friends that are waiting for you to begin your machine quilting business. If this is you, then congratulations! You are truly lucky! If this is not your situation, then you will have to “work” to make your machine quilting business a success. There are many ways to begin (and grow) your machine quilting business. One of the first things you should do is to go to the local quilt shop and ask permission to drop off business cards and brochures about your business and be sure that you bring samples of your work with you to show the quilt shop owner. You are enthusiastic about your new business and the local quilt shop may be receptive to new quilters. But, sometimes the local quilt shop is not receptive to you and your new business. If this happens to you, don’t take it personally! There can be many different reasons for this. (If you are a quilt shop owner, don’t worry! I’ll talk about your shop in a little bit.) There are many ways other than the local quilt shop to get your business moving. The question for you is – What are the ways that you have started your machine quilting business or found new customers other than through the local quilt shop? Please leave your answers in the comments section. I know that your ideas will be a GREAT help to everyone who reads this blog. I returned home last night after my teaching trip to the Kansas City, KS area. 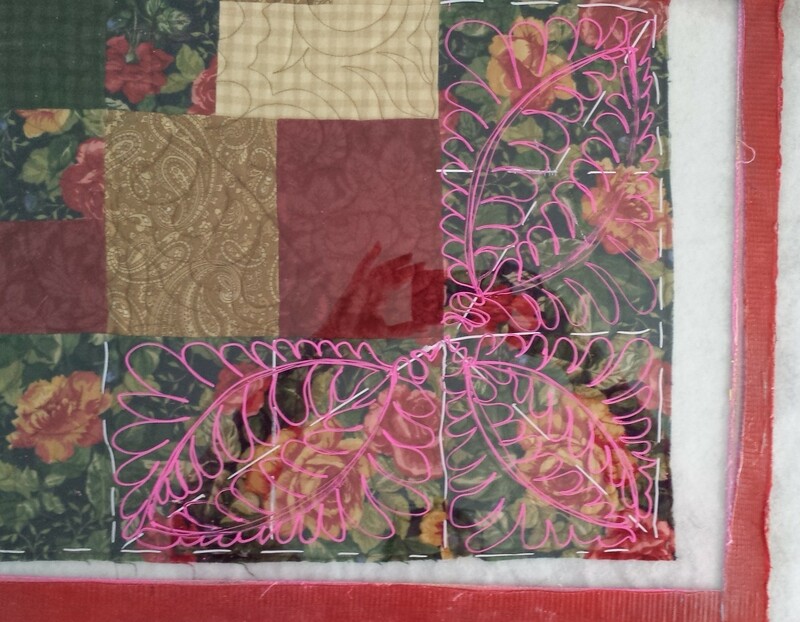 I was invited to give a presentation to the MO-KAN Machine Quilting Guild at their October meeting and then I had the opportunity to teach a few days of classes. A huge THANK YOU to the MO-KAN Quilt Guild for my wonderful experience. Thank you Peggy for letting me stay at your home and driving me all around and Thank You to Sherri for her help in arranging my visit and coordinating my classes. You ladies are wonderful and so is your group!